A combination of a Liberal Democrat and a Social Democrat, Dudley was a believer in democratic practices, respect for human rights, freedom of expression, and the independence of the Judiciary— an upsurge in Domestic agriculture for the revival of the economy was one of his favourite ideas. Developing Agricultural Colonisation Schemes started by his father D.S. Senanayake was another task he undertook with much enthusiasm. A political career spanning over five decades, and gaining experience, as a member of the State Council in 1936, he became the Minister of Agriculture. He succeeded his illustrious father in early 1950s as Prime Minister and subsequently as Leader of the Opposition, but it was a difficult and unpleasant political career. He loved his people and the country and the people loved him too. Regrettably, he had a struggle working with some powerful UNP leaders. At one stage some people whom he helped come up to positions filed legal action against the great man. Father D S Senanayake was a man of restricted book education but of incredible sophisticated wisdom. His eldest son an illustrious product of S. Thomas’ College, Mount Lavinia and blessed with an adorable personality, young Dudley Shelton, “Shelley” to close acquaints, showed little attention to marriage. The Senanayakes of Botale Walawwa in Sapitigama Korale were well enriched in politics by the second decade of 20th Century with Senanayake brothers FR and DS spearheading the Independence and temperance movements. The dealings in connection with the disturbances of 1915, during which time, under the orders of Governor Chalmers, 30- year-old D S Senanayake was unfairly and unjustly arrested along with his two brothers FR and DC and a host of leaders of temperance movement on a trumped up charge of involvement in riots. At Welikada jail they were served food in dirty tin plates that was pushed under the door. While father supported the Second World War effort in 1940, Dudley and his friend JR was indifferent; they thought that by extending our support to enemy we could obtain independence immediately. Both of them visited the Japanese Consul in Colombo and expressed their support to Japan. DS, The Head of State was furious over the high-handed act of the two young Ministers, and to their shock and surprise, they were thoroughly chastised by him. Further if not for the father’s influence and excellent relations with the Governor Calcott the British government would have arrested the young man. Apart from this incident the father never interfered in son’s political activities. British government invited Dudley Senanayake to represent then Ceylon to participate at the Coronation of Queen as its head of state. The organisers ran short of a horse-carriage for one of the Heads of State and wanted our young Prime Minister from their ‘LIPTON’s Tea Estate’ to share the carriage with a female diplomat of a newly emerged African British Colony. Dudley vehemently opposed the idea; he not only declined the offer, but threatened to take the next flight home. The London Home office authorities replied, “It is an insult to her Majesty if you do that” for our leader to retort, “Officer, your suggestion is an insult to my great nation.” With an ‘Our deepest regret’ note British authorities apologized before arranging a special carriage for the great man—the present generation of politicians need to study how Senanayakes ran this country. Dudley stepped aside and allowed JR to accept the Leader of Opposition post after the 1970 defeat and leadership of UNP group in the House was entrusted to JR. The party rank and file however were pressurizing Dudley to return to active politics. “...... this larger struggle for reform of the Party was affected by, and in turn affected the deteriorating relationship between JR and Dudley Senanayake. After a wait of nearly 20 years JR was becoming impatient for the leadership. In the last quarter of 1970, the division between JR and the party leader indented because of sharp difference on tactics and strategy on opposition to the government.”—Profs. K M de Silva and Howard Higgins --JRJ Biography: pp- 225 -240. 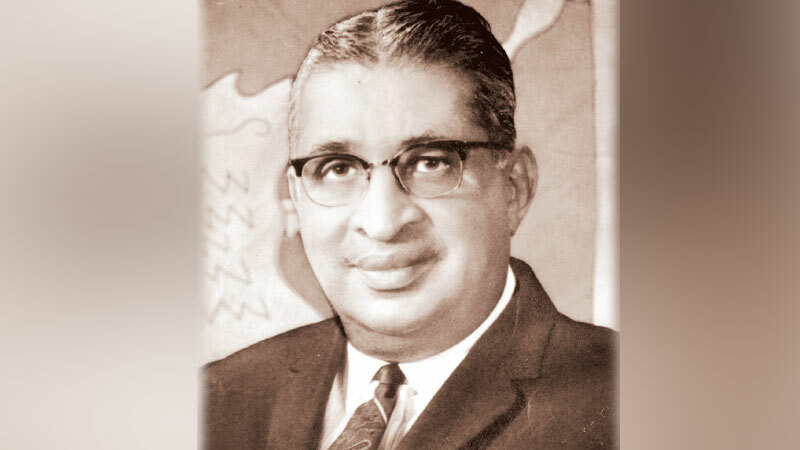 The Biography further says how Dudley won the majority in the party’s Working Committee as JR continued his theory, “Constructive Accommodation” with Sirimavo Bandaranaike’s UF government. JR deliberately avoided public rallies held island-wide. JR even felt that if Sirimavo invited the UNP to join the government, that the party should do so and accept portfolios. As the book narrates; “As for the UNP, Dudley Senanayake moved swiftly to cut JR down to size” and how M.D. Banda senior member moved a resolution to have JR expelled. JR Jayewardene took Dudley to courts though he had only A.C.S. Hameed on his side in the Working Committee: the other ally, V. A. Sugathadasa, was sick at the time. Failing in all his manoeuverings, plotting and scheming to disrupt the party progressing under the leadership of Dudley, finally, JR filed action in District Courts of Colombo challenging the authority of his leader—the petition was supported by H W Jayewardene QC [JR’s brother] and four other QCs. After the intervention by moderate leaders like Paris Perera the case was withdrawn and the differences patched up.